Chelsea vs. Sunderland : 19 April 2014. If we rolled off four league wins in a row, Chelsea Football Club would be league champions for the fifth time in our history and for the fourth time in just ten seasons. I was up early – too early, 6.45am – and began the day with a few errands. At 11.45am I had collected Young Jake from Trowbridge, at midday Lord Parky joined us and Bournemouth Steve was picked up at Amesbury Services, close to Stonehenge, at 1pm. The sense of anticipation was palpable. Talk was now of the league, whereas en route to Swansea the Champions League had taken precedence. Of the two, I found it hard to choose. But, to be honest, why did I have to choose? Whatever will be will surely be. After a few miles, I gulped down a can of Starbucks double-espresso (my second of the trip) while Parky and Jake were on the lager. On the way up, Young Jake asked Parky and I about our favourite Chelsea goals that I had seen live. My stock answer to this question has always been the same. Had I been present at the Chelsea vs. Norwich City cup replay in 2002, I might have chosen Gianfranco Zola’s impudent flick. My answer came from a few years earlier. What was my favourite ever Chelsea goal? It was Gus Poyet’s scissor-kick volley from Gianfranco Zola’s sublime lob in our league opener against Sunderland on Saturday 7 August 1999. As I reminisced, I easily remembered the complete joy that I had experienced on that sunny Saturday almost fifteen years previously. Although the shot from Poyet was magnificent enough, it was the other-worldly lob from our Sicilian maestro which made it so wonderful. Zola’s vision and intelligence, plus his perfect application, still makes warms me after all these years. I love the way that Zola controls the ball and touches it – caresses it – into the correct position in order for his audacious assist. It was pure artistic brilliance. 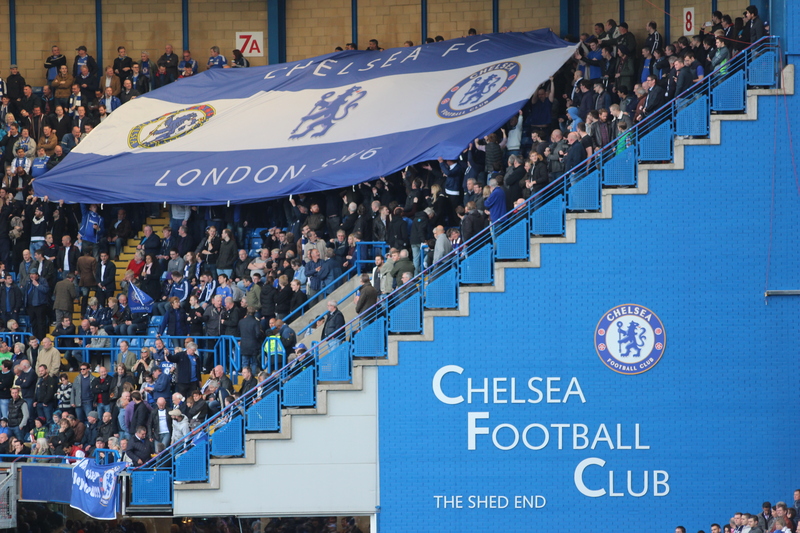 The goal sent the Stamford Bridge stadium into a blue frenzy. Immediately after, I recollect that my friend Glenn and I clambered up to the walkway immediately behind our seats and, there and then, recreated the high-kick from Poyet. We were already calling it the goal of the season. What wonderful and happy memories. The irony of Poyet (who has had a love-hate relationship with us Chelsea supporters since his departure in 2001) returning to Stamford Bridge with Sunderland was not lost on me. So, Connor Wickham. I pondered what role his two goals at Manchester City might play in the final outcome of the league title. In truth, the goals may not mean much at all. The championship is decided after each participant has played thirty-eight games. The two goals at City may be a minor detail. However, with just four games to go, it meant that City’s final position was not, now, in their hands. It pushed the advantage back towards firstly Liverpool, but also us. I was bristling with excitement throughout the last few miles of the journey. It was a fine day in London. Let the fun begin. It was a typical pre-match in The Goose. Talk was of other things – not really the Sunderland game – and a few lads were full of Madrid and, whisper it, Lisbon. As I lined up in the queue for the turnstiles underneath the blue sky above the Matthew Harding stand, it dawned on me that a win against the bottom team in the division was perceived by many to be a foregone conclusion. Did I? Well, maybe yes. Guilty. In came Mark Schwarzer to replace Petr Cech. The back-four picked itself. Matic and Ramires holding. The attacking three were Willian, Oscar and Salah. Upfront, alone, Samuel Eto’o. Sunderland only brought around eight hundred fans. We were a little laboured at the start and I commented to Alan that there was a lack of a spring in our step. Was this the result of our number of games this season? Debateable. A shot from our former striker Borini flashed wide, but soon after a Chelsea move led to a corner, from where we struck. A nicely played delivery from Willian, with just the correct amount of pace and dip, found Samuel Eto’o, with held off a half-hearted challenge to volley home from the six-yard box. Eto’o wheeled away to celebrate in front of the Chelsea match. Pressure off? Not a bit of it. Sunderland worked a corner well, though our collective lapse in concentration was culpable, with the ball being played back to the unmarked Alonso. He volley flew through a pack of players and Schwarzer was unable to gather. The ball spilled away from him and Connor Wickham, yes him, neatly flicked home. The game opened up, and Oscar had shots on goal. On thirty-five minutes, another Willian corner produced more uncertainty in the Sunderland box. On this occasion, a thundering Ivanovic header was forced up on to the underside of the bar by Manone. Matic fancied a dig from outside the box, but Manone saved. Sala, playing well on our right, reacted well but Manone just reached the cross before Eto’o could pounce. There was frustration at the break, despite some good work from Salah, Matic, Oscar and Willian. Eto’o had shown good control, eager to go and find the ball, but I sensed the need for an extra presence in the box. I suggested that Ramires should be replaced by Demba Ba, with us playing 4-1-3-2. Did we need two defensive midfielders at home against lowly Sunderland? The second-half began and we began well. Willian, from deep, ran with the ball for what seemed an eternity. With the Sunderland defenders back-peddling and seemingly over-stretched, Eto’o was played in. His deliberate shot curled tantalisingly past the post. I was already up and celebrating. I howled in agony. On the hour, Jose replaced the fitful Oscar with Demba Ba. I was very pleased to hear the home support rallying behind the team in their half-hour of need. This was good stuff. I felt encouraged and hoped that the players could feed off the positivity. Willian teed up Ba, but our striker was off balance and his shot was screwed off target. Mourinho replaced the tiring Salah with Schurrle and I implored him to stay wide and hug the line. Some half-chances came and went. A shot from Schurrle drew a save from Manone. We were on top, but lacked a finish. The cutting edge, the cliché of our season, was nowhere to be seen. With a quarter of an hour left, Fernando Torres replaced Eto’o. A spectacular bicycle-kick from one of many Willian corners flew over. A Torres header was saved. The clock ticked. The atmosphere grew more nervous. With less than ten minutes remaining, the usually steady and reliable Azpilicueta slipped calamitously as he brought the ball out of defence, with Altidore lurking. I sensed danger immediately. Altidore galloped away, but Azpilicueta lunged at him just before the American was able to pull the trigger. Dave’s challenge – to my eyes, some hundred and twenty yards away – looked like a definite penalty. Mike Dean – “the Scouser in the black” was never more apt – had already ignited a great deal of animosity within our ranks all afternoon and he added to his role as a figure of hate by pointing to the spot. If they score this, we will probably be right out of the league title race. If they score this, the Mourinho league run could be over. Borini – on loan from Liverpool, ugh – calmly slotted home. Schurrle broke in from the left and Mannone flew himself into the air to dramatically tip over. For all of our possession – and chances – the Sunderland ‘keeper had few saves to make all game. Torres’ claim for a penalty was waved away by Dean, now the devil incarnate, and the derisory boos grew louder. Five minutes of extra time was signalled, but our attacking spirit had dwindled to a memory. I was in agony during those final minutes. I looked away. I stared at the floor. My mind was full of defeat. It was such an alien feeling after our dominance at Stamford Bridge over the past ten years. At the final whistle, hideous and hateful boos behind me. Yes, it’s true. Some of our “fans” are spoiled fools. Versus Sunderland, I don’t think we were bad. Several players did themselves proud. But our finishing was bad. It has become the story of our 2013-2014 season. I just glowered at him. Back at my favourite Italian restaurant, we tried to lighten the mood a little. Pizzas hit the spot, but conversation was difficult. The rug had been pulled from underneath us and our hope of a title had been seemingly extinguished. I can cope with near misses and missing out on silverware – of course – but it was just the sudden shock of defeat, when we appeared to be hitting some form, which made this defeat seem so tough. It was, as the phrase goes, just typical Chelsea. Beat the strong teams, lose to the weak ones. It was our way for years. However, after Villa and Palace, it was also the third game where we had prefaced a Champions League game with a meek league defeat. I looked ahead briefly and quickly to a potentially riotous second-leg against Atletico Madrid in around ten days’ time and experienced a flutter in my heart. This entry was posted in Season 2013-2014. and tagged 2013-2014, Booing, Gus Poyet, Jose Mourinho, Sunderland by Chris Axon. Bookmark the permalink.